A Termite Queen And Her Ultimate Sacrifice The termite queen may be the mother who makes the ultimate sacrifice for her swarms of children. Isolated in an earthen capsule, she lays more than a quarter-billion eggs in her lifetime. On the eve of Mother's Day, NPR honors this species' story of struggle, rebirth and death below ground. Hidden away in a towering, castle-like mound on an African savannah lives the termite queen. There, isolated in an earthen capsule, she lays more than a quarter-billion eggs in her lifetime. "The concept of the queen was basically named by early colonial naturalists," says writer Lisa Margonelli, who has been studying the mysteries of the termites. "When they dug through the termite mound and found this large female figure pumping out eggs they said, 'Well, that's the queen and she must be in charge.' "
The termite queen may be the mother who makes the ultimate sacrifice for her swarms of children. On the eve of Mother's Day, NPR honors this species' story of struggle, rebirth and death below ground. 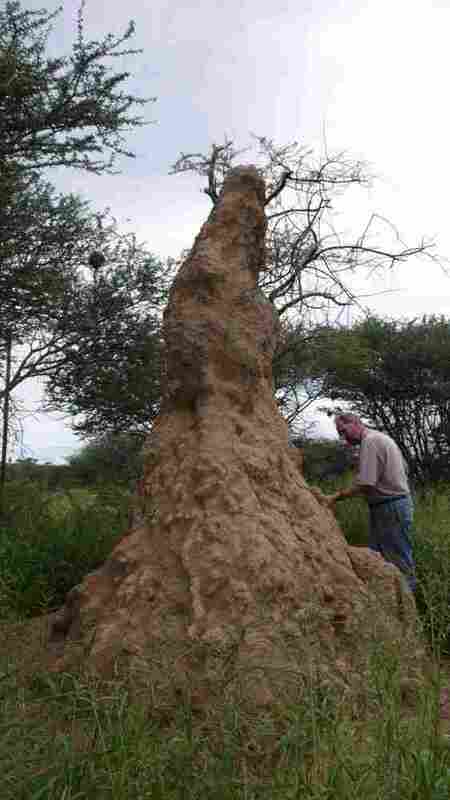 Inside the termite mound is a world filled with nonstop activity and purpose. Each termite has a highly specified job. There are worker termites, soldier termites, and a special group of males and females called "alates" that are able to reproduce. Mark Moffett, researcher at the Smithsonian Institution and a National Geographic photographer, has photographed these clouds of termites as they emerge. "They're very edible," he says. "Around the world, many people grab them and eat them. They're quite tasty. I usually fry them." The termites' flight lasts only a brief moment before they float to the ground. When the queen lands, she scratches off her wings. "One moment we see her with her wings intact and the next moment she steps away and her wings are lying in the grass," wrote South African naturalist and poet Eugene Marias in his 1937 book The Soul of the White Ant. "She's much, much quicker than a woman who discards her evening gown and hangs it over a chair." If a queen happens to meet a king, they crawl off, dig a hole and disappear forever below ground, never to see the light of day again. The two mate, and the world of the mound begins. Even an entomologist like myself, who loves all creatures equally, is pretty startled when he sees a termite queen. "The queen produces an egg every three seconds for 15 years," Margonelli says. "Her body distends. What starts off as being the length of a dime extends to be about the size of a human index finger." As the workers construct elaborate vaulted chambers that can rise as high as 30 feet aboveground, the king remains inside a protective capsule with the queen throughout her life. "This little male king sits next to this enormous female that can be several inches long, a ghastly thing," Moffett says. "Even an entomologist like myself, who loves all creatures equally, is pretty startled when he sees a termite queen." Her skin is stretched and translucent, revealing a bubbling juice underneath the surface. The babies begin to tend the queen. They feed her and they clean her. She sweats an exudate that they lick off continuously. These workers carry away the eggs, stack them in little piles and tend to them until the little termites hatch. Gradually, the queen gives birth to the entire mound. Soon the queen is too big to leave the capsule. She has tiny legs and little stumps of wings and can't move. "She really is this captive ovary," Margonelli says. It's said that when she comes to the end of her usefulness, her children gather around her and lick her to death, drawing the fluids and the fats out of her body. 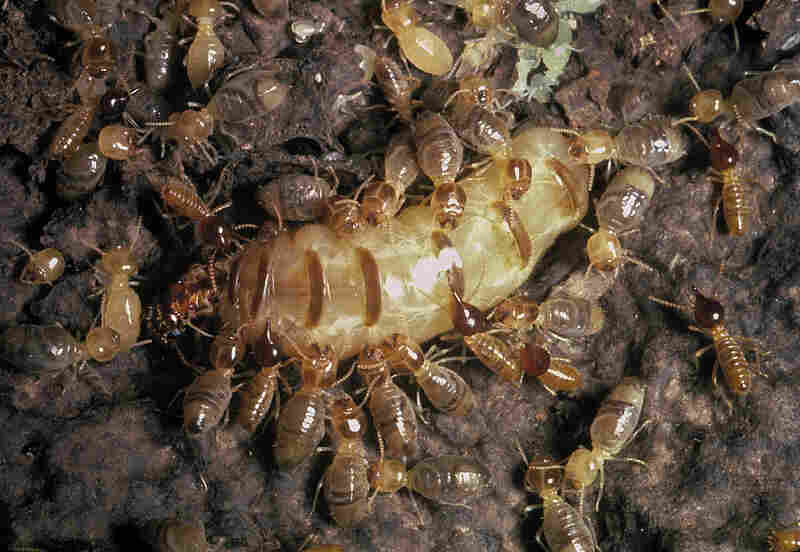 A termite queen being tended by her children, the worker termites. "There's this interesting question," Margonelli says. "Is she in charge — or is she in fact the captive slave, the ultimate queen mother who sacrificed everything for her children and the mound?" As the queen dies the workers keep tending her, cleaning her, and waiting for eggs. "The queen is their mother," Moffett says. "She is their god. They have formed their whole identity around her health and safety. Once she's gone, life does not make much sense." The entire mound gradually dies out. "What they leave behind them is this immense shell, this city, this huge mound. It's possible that it's repopulated by her offspring, the young virgin queens she sent out earlier. That starts the cycle anew." Audio produced by The Kitchen Sisters (Davia Nelson & Nikki Silva), with Nathan Dalton. Mixed by Jim McKee.